Coop's Hot Fudge for sale. Buy online at Zingerman's Mail Order. Gourmet Gifts. Food Gifts. I’ve been patiently searching for a great hot fudge ever since Zingerman’s Creamery started making gelato a few years ago. Till now it’d been a sickly sweet, unlucky quest. Most have too much sugar. Many have a laundry list of unpronounceable ingredients. Then along came Coop’s. To be honest, the jar caught my eye first. A wax seal drips from the top looking like chocolate that leaked out of the vat. Usually when I see clever packaging like this I’m suspect. It often overshadows the food. To my surprise the hot fudge inside was good. Not just good, pretty great. Sporting just six ingredients, all of which I promise you’ll recognize, Marc Cooper’s hot fudge is milky and chocolaty without being overly sweet. Microwave for less than a minute and you’re in business. 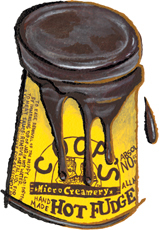 "Above all, you walk away from a spoonful of Coop's hot fudge with only happy memories. The rich flavor and creamy texture is all any ice cream-based dessert needs to put it over the top."